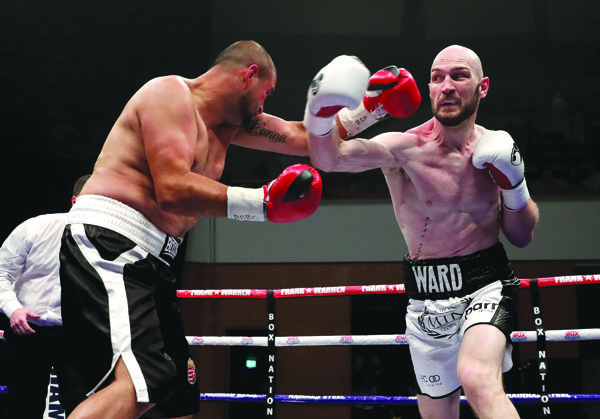 IT has been a busy first year as a professional for Steven Ward and the Monkstown light-heavyweight wants to finish it in style when he takes on Przemyslaw Binienda over six rounds on Saturday before looking to push on in 2018. ‘The Quiet Man’ began his career in the paid ranks last November and has had four fights since, winning them all, so to finish 2017 with a 6-0 record would pave the way to look at challenging for belts next year. “It’s coming up to a year (since my debut) and to have six fights in the first year is brilliant,” said Ward. “A lot of boys don’t get that, to be fighting every two months. It’s been a busy year, but it’s been good. I wouldn’t complain about it, definitely not. “I really want to finish the year on a high. The management at MTK in my eyes is the best management there is. “Just look at what they’re doing in the sport. The reason boxing has really taken off in Belfast is to do with them they have so many fighters. They can put us on good shows. “I’m looking forward to getting this one over and then start knocking on the door for some sort of a title for next year and really start pushing forward. Boxing has indeed been enjoying something of a golden era with Carl Frampton and Ryan Burnett capturing world titles, Jamie Conlan challenging for one on Saturday with his younger brother, Michael claiming amateur gold in 2015. Ward says it is a privilege to be a part of that story and wants to etch his name into this glorious period for local pugilists. “Talent has always been there, but it was all in the amateurs,” he noted. “With everyone turning pro, it just escalated and has got better and better. “Now, boxing in Belfast is booming and that’s brilliant. It’s brilliant to be a part of that. There was a hiccup back in late July with the cancellation of Carl Frampton’s homecoming bout against Andres Gutierrez which meant Ward and many others scheduled to appear on the bill missed out also. However, he is glad to get the chance to box this weekend to make up for that. “I’m looking forward to this one,” he confirmed. “It was a bit rubbish the way that last one fell through with Frampton’s last one (against Gutierrez) but then you couldn’t have written that. Ward is one of three local fighters trained in Manchester by Jamie Moore with Frampton and Conrad Cummings also based out of the Salford gym. Having some familiar faces as stablemates has helped Ward get fully tuned in during his training sessions and he is hopeful that will shine through on Saturday. “When I was over here before over at Oliver’s Gym before moving to Jamie’s, camps were really grim,” he admitted. “I’m not saying they’re exciting, but having the boys here like Conrad who is one of my best mates and then Frampton there, it just makes camp a wee bit easier. There is a bit more banter. “Before when I was here on my own, sometimes you would be sitting going ‘I’ll go and do my second session in an hour’ maybe at four o’clock and then it’s nine o’clock at night and you still haven’t went.